When you are in bear territory, the bears call the shots. Imagine yourself taking a peaceful stroll through the forest, enjoying the splendor of nature, when suddenly you spot a bear. The prospect is terrifying, but it is a real danger for any nature enthusiast. Bears are much larger and more powerful than humans, and are fully capable of not only attacking, but killing and eating a human being. If you are caught unaware, unarmed and alone by a bear, there are a few safety techniques to help you escape unharmed. If you believe there is a danger of meeting a bear then bring along protection. 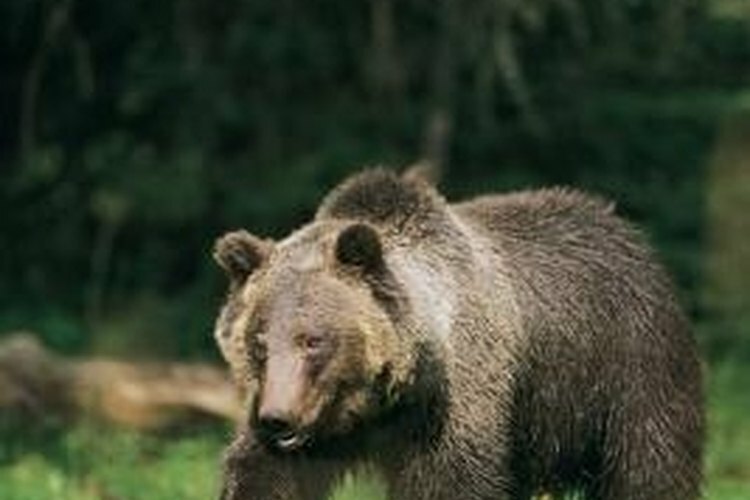 Mace and pepper spray are effective defense tools if a bear charges you. The stinging is often enough to ward off the bear and allows you the time to escape. Many outdoor supply shops sell bear mace, which is designed specifically to fire at extreme ranges with accuracy before the bear can get close. This is a last resort when encountering a bear, however, and should only be used if the bear charges you. Stay calm if you come upon a bear. This is the most important step: do not panic. Panicking will render any planning worthless and will put your life in even greater danger. Stop and take assessment of the situation. Look around and see what routes of escape you have. Determine how close you are to other humans who can help you. Also, look for cubs. A bear protecting its cubs is especially dangerous. Look up into the trees and in the bushes for signs of cubs. If your escape route puts you between the bear and its cubs you have a greater risk for being attacked. Do not run away from a bear encounter. Anyone who has played with a dog knows that a predatory animal will always chase anything that is running away. Instead, back away slowly, while crouching slightly, to maintain a submissive posture. Do not show your back. Avoid eye contact. Making eye contact with an animal is a sign of aggression, and could prompt an attack from the bear. Keep the animal in your peripheral vision in case it tries to charge. If the bear attacks then you must try to scare it away. Spray your bear mace if you thought ahead to purchase some. If you are unarmed, unzip your jacket and grab the bottom, lifting it up over your head. Many animals, such as cobras, use a similar tactic of trying to appear larger than they are. Even the bear will stand up on its hind legs in order to appear more intimidating. By making yourself appear larger, you increase the chances the bear will second guess picking a fight with you. You can also scream and shout as loud as you can. Wave sticks around and bang rocks. Do everything you can to make yourself seem as intimidating as possible. Let the bear know that you won't be easy prey. There is no guarantee that the bear will run off by your posturing. Bears are very fast sprinters, so outrunning one is not easy. You have two options at this point, depending on the species of bear you are up against. If you are facing a large bear, such as a Grizzly, curl up into a ball and protect your head and neck with your arms. Curl up to take the beating and hope the bear gets bored and leaves. If you are facing the much smaller black bear, you can attempt to fight it off with sticks and rocks. According to the Colorado Division of Wildlife, there are reports of humans scaring off black bears by fighting back. In cases of extreme hunger, bears have stalked humans for food, although this is rare. If the bear attacks at night or appears like it is following you, this is an indication that the bear is actively hunting for meat and does not care if it is human. Never stay in an area where you've seen a bear. Whenever you encounter a bear immediately leave the vicinity and return to the nearest ranger station. Alert the ranger of the sighting and ask for advice. Take no chances. The best bet for avoiding bears is by not attracting them. When camping, keep all food and other scented materials locked up in metal containers away from your site. The containers, known as bear lockers, are typically provided by the park service. After meals, clean up after yourself thoroughly, disposing of all food scraps. While hiking, make periodic loud sounds to avoid surprising a bear. Kick some dirt, knock a stick on a tree, or shout something from time to time.